It’s been one week since Harvey hit Texas. Here’s what you need to know. It’s been one week since Hurricane Harvey hit the Texas coast. While the rainfall may be in decline, the floodwaters are only beginning to recede. Here’s what you need to know. It’s been one week since Hurricane Harvey — which was downgraded to a tropical depression on Wednesday — hit the Texas coast. While the rainfall may be in decline, the floodwaters are only beginning to recede, and it’ll be weeks, if not months, before Houston resembles itself. In the meantime, officials are advising private well-water owners and users to test their water for contamination and disinfect it. Local country health offices can offer water testing services or well owners can reference this list of water testing facilities approved by the state of Texas. The Texas Well Owner Network also has several resources on its website with information on how to disinfect a water well. In a statement Thursday, Gov. Greg Abbott announced he had sent a letter to county judges outlining the types of assistance counties can receive, and he also provided information about aid eligibility for areas affected by Harvey. "I want all Texans to know that Texas is committed to helping them through the recovery process, and we will be with them every step of the way," Abbott wrote. Abbott has also announced he had increased the number of National Guard troops to help with Harvey to 24,000. Previously the governor had announced the full deployment of the Texas National Guard — which consists of 14,000 members. Abbott and other statewide officials will receive another briefing on Harvey Friday afternoon, per a statement released by the governor's office Thursday afternoon. Thursday morning started with an explosion at a flooded-out chemical plant in Crosby. Arkema Inc. said the Harris County Emergency Operations Center notified the company at 2 a.m. of two explosions and black smoke coming from its Crosby plant, which was inundated by floodwater. Following the explosion, a Harris County Office of Homeland Security and Emergency Management spokesman tweeted that there was a mandatory evacuation in place for those living 1.5 miles around the facility. On Thursday morning, the Harris County sheriff described the incident as a chemical reaction, not an explosion. The Harris County Fire Marshal's office and the Harris County Sheriff’s Department downplayed environmental and public health risks from the plant. The fires might not fizzle out soon, however. Officials say they expect more fires as a result of the flooded chemical plant. Richard Rennard, an Arkema spokesman, added that people who were exposed to smoke or fumes from the plant should seek medical attention, according to reports from USA Today. Ten to 15 people have already gone to the hospital as a precaution, though many were released. On Wednesday evening, Jasper County Judge Mark Allen issued a mandatory evacuation for residents living along the Neches River, which is expected to crest more than six feet above its previous record. According to the Beaumont Enterprise, the local reservoir is expected to release 44,100 cubic feet of water per second. This could lead to extreme floods, which could be life-threatening when coupled with the heavy rainfall Harvey has already brought to the region. The city of Beaumont — which is home to roughly 120,000 people — has lost its water supply, according to a news release issued by the city Thursday morning. Officials say they have to wait until the floodwaters recede before assessing the extent of the damage to their water pump; they have no idea how long that will take. On Wednesday evening, the Corps of Engineers issued a warning to Jefferson County — home to about 660,000 residents — regarding massive flooding. According to officials, water from the Neches River was spilling into Steinhagen Lake faster than they could release it. Overnight, Fort Bend County Emergency Management changed a voluntary evacuation to a mandatory order for several subdivisions in the Barker reservoir area in Houston, according to KHOU. 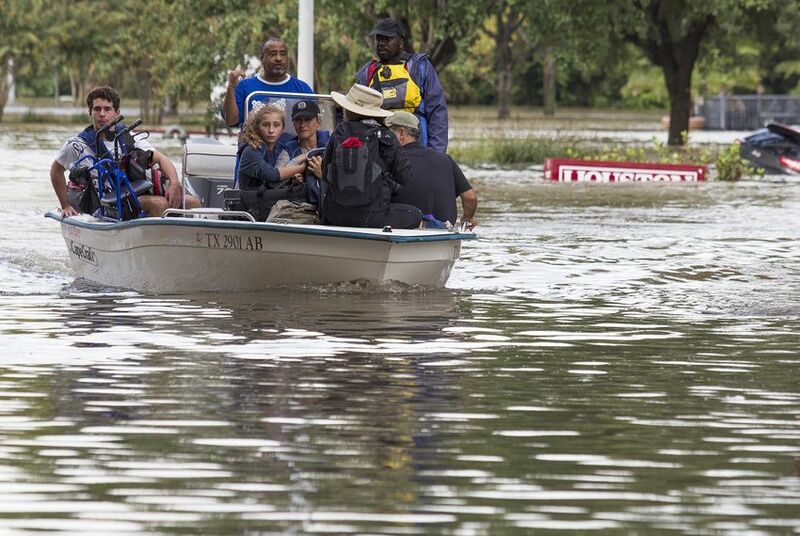 Federal officials are still looking for ways to help the storm-ravaged coast. President Donald Trump visited Texas Tuesday and, according to multiple reports, will likely return to the state this weekend to visit the harder-hit Houston area. White House Press Secretary Sarah Huckabee Sanders said Wednesday evening that the Trumps are “looking into some different options” for making personal donations for Harvey relief. Sanders also noted that Trump has talked “extensively” with Abbott as well as mayors from several cities that were hit the hardest. Speaking of Trump: The President spoke by phone with Abbott Wednesday evening while aboard Air Force One with Chief of Staff John Kelly. Vice President Mike Pence went to Corpus Christi International Airport Thursday morning to assess Harvey’s destruction and meet with families who were impacted by the floods. Pence was joined by Labor Secretary Alexander Acosta, Secretary of Transportation Elaine Chao and Secretary of Energy and former Texas Gov. Rick Perry. Pence’s arrival comes just a few days after Trump visited Austin and Corpus Christi, but the Vice President still has more stops before leaving Texas: after visiting Rockport, they are scheduled to return to Corpus Christi later this afternoon for a media availability at the airport. Perry said Thursday he is confident that Congress would deal with federal aid “in a timely way.” However, he added that he had no idea how much relief efforts would cost. Over the past few days, many New Yorkers and New Jerseyans have expressed anger over colleagues who voted against Hurricane Sandy funding. Perry, however, said people shouldn’t be distracted by such “banter” when discussing Harvey. “This is about now. This is about a diverse population that deserves the American government's support,” he said. At an event at First Baptist Church in Rockport with Pence, Abbott announced that he had issued a proclamation announcing Sept. 3, 2017, as a Day of Prayer in Texas. Overnight, six more fatalities were confirmed, putting Harvey's death toll at 31 so far. According to the Associated Press, the most recent deaths include a man who stepped on a live electrical wire in floodwater and an evacuee who was found unresponsive on a charter bus. Most other deaths were a result of drowning. Despite these tragedies, Houston is trying to move forward. Bus service and the city’s light rail system resumed on a limited basis starting Thursday and the city’s trash collection began Wednesday evening. Some Dallas gas stations could run out of fuel over Labor Day weekend because of supply disruptions caused by Harvey, the Fort Worth Star-Telegram reports. Multiple refineries have shut down in Houston, Baytown, Port Arthur and other areas slammed by flooding. In an email to The Texas Tribune Thursday, a Galveston County spokeswoman confirmed that the mandatory evacuation had been lifted for the city of Dickinson, adding that all major roadways in the county were “clear and open” and that county facilities would resume operations starting Friday. Katie Riordan contributed to this report.